Browse our selection of high-end, luxury apartment communities across the country to find your next home. Find out the benefits of living with Inland Residential and why you should call one of our communities home. Learn more about Inland Residential and how we strive to give you the best experience possible. Depending on your location, some of our luxury features may include granite counters, stainless-steel appliances, resort-style pools, premium fitness centers and much more. All Inland Residential Communities welcome your furry family members, and many feature their own dog parks, washing stations and more. Some restrictions may apply. Our staff, both on-site at our communities and in the corporate offices, are the best in the industry and have decades of experience to back it up. 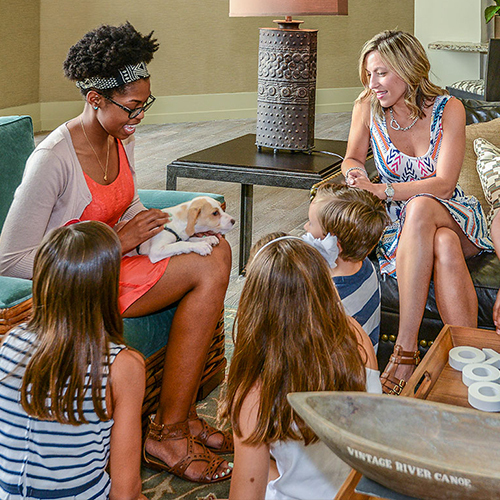 We combine a great location with resort-style amenities to deliver an unbeatable living environment. Our modern one, two, and three bedroom apartment homes offer the perfect combination of convenience and luxury. Each home is complete with fresh finishes, an in-home washer and dryer and a chef's kitchen. Highlands of Grand Pointe offers luxury apartment living without compromise. Elegant one, two and three bedroom apartment homes deliver a full list of amenities in a gated community with 24-hour maintenance, a deluxe pool and spacious clubhouse. Conveniently located, Ranch at Pinnacle Point Apartment Homes is minutes from Pinnacle Hills Promenade, Pleasant Crossing, and the Scottsdale Center, which offers first-class shopping, dining, and entertainment options. Enjoy our state-of-the-art fitness center, a relaxing free-form pool, and a private movie theater. We offer a variety of spacious floor plans, complete with a number of upscale features that define the one-of-a-kind lifestyle found exclusively at our beautiful, lush community. With a fabulous location in the heart of New Tampa, and in close proximity to Tampa International Airport, you will love coming home to The Preserve at Tampa Palms. "The creek & walking trail in the back are wonderful! I also love the management team & the maintenance team, they are so nice & very responsive!" "This apartment community is simply amazing. It is so clean and the staff make you feel right at home. If you're looking for a place to live, this is it. Hands down!" "We recently relocated to the area boy did we hit the jackpot finding Circa! It is like living on vacation. Resort lifestyle, amazing staff and great facilities. We love our apartment, neighbors and lifestyle. Don't hesitate to move here!" "I love the recycling vip service! The staff is always helpful and prompt including maintenance. I have never lived in an apartment complex that was as convenient and cordial as this one!" "Love living here! Neighbors are all very nice and their dogs are all great too! The gym is awesome and club house is always clean. The office staff are all awesome! They are happy to talk anytime!"